What can I say about today that will do it any justice? One thing is certain: it is unanimous among the touring choir that today was one of the most amazing days ever! 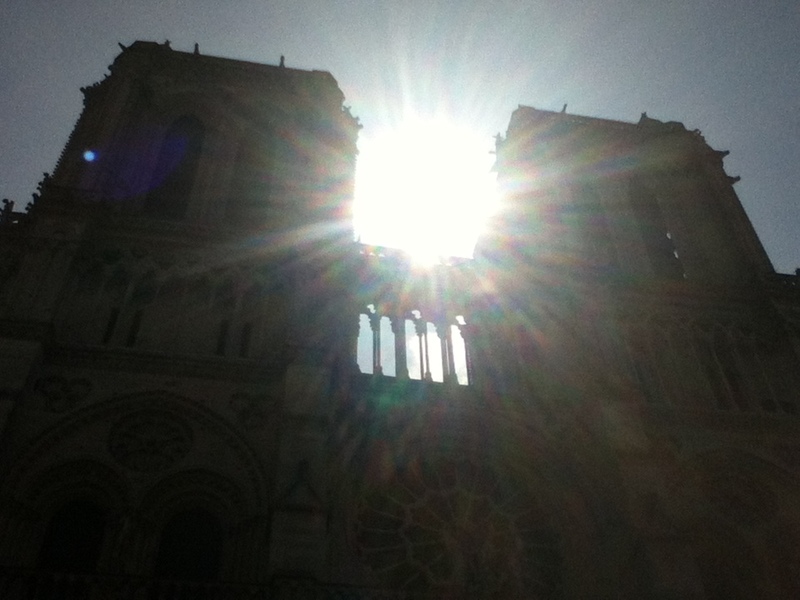 It began with the world-famous Notre-Dame Cathedral, which is hard to even describe if you have never been. 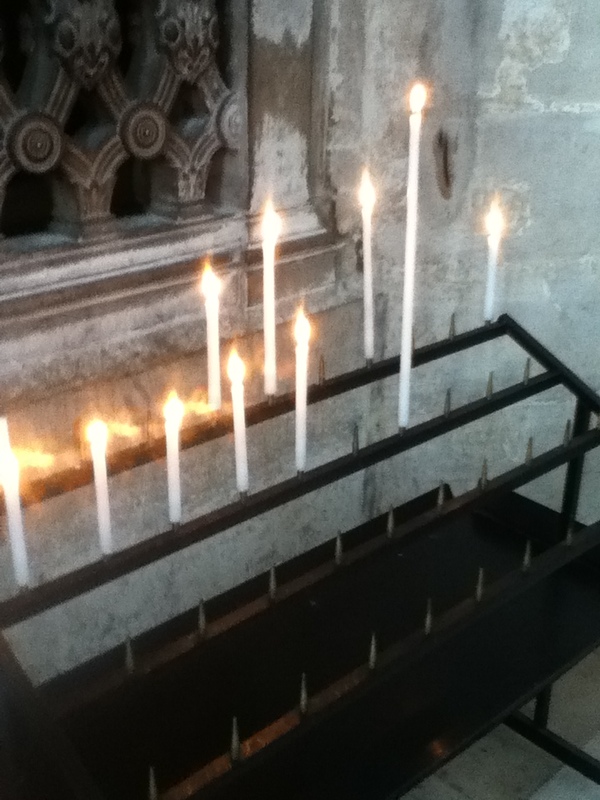 It’s more than just a Gothic cathedral, it is so beautiful and it has its own energy, it really seemed as though we had reached the very heart of Paris. 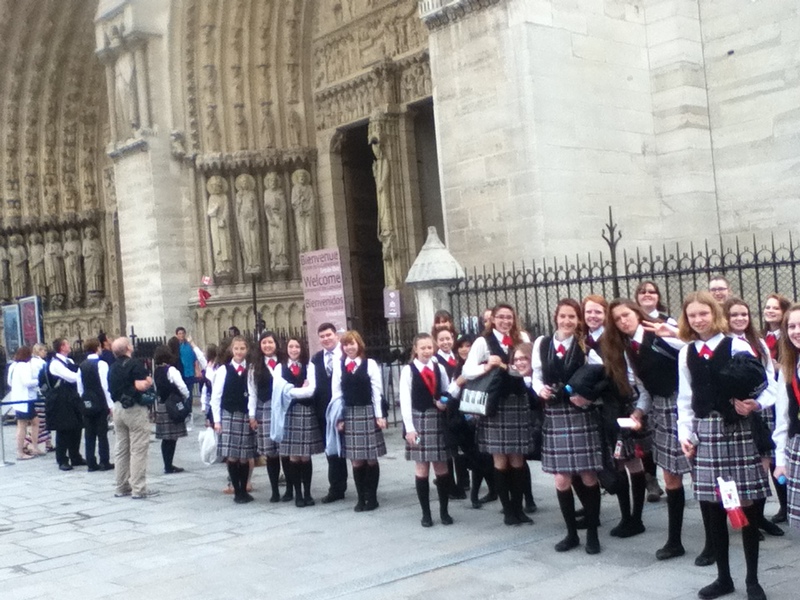 Since we were a group, looking very classy in our kilts, we got to skip the line and see “backstage”! This included seeing gargoyles and statues most people don’t see, and a “secret” spiral staircase that was altogether wonderful and a little scary. 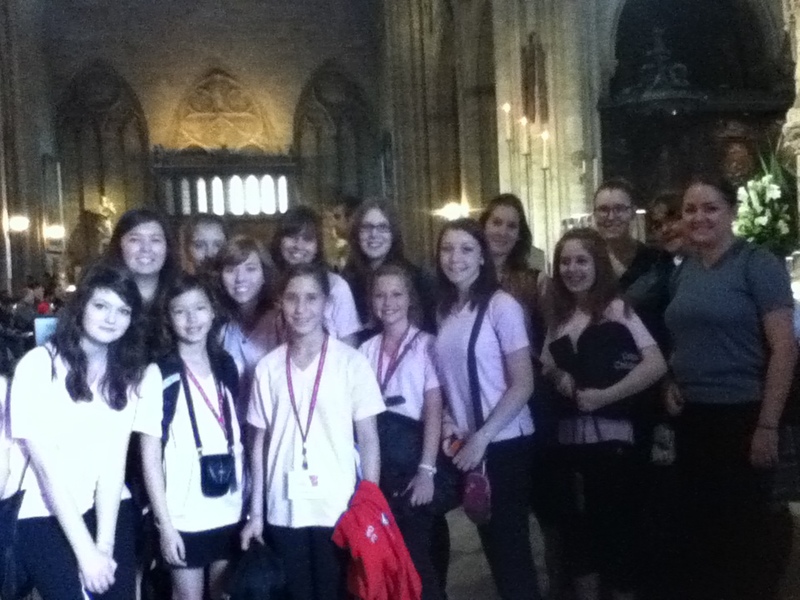 After a brief rehearsal we were led upstairs into the cathedral itself. It was everything we had been told and more: huge, elaborate, mysterious, and filled with light pouring in from the stained glass windows. And although he is a fictional character, the place is so alive it seemed that any minute Quasimodo himself might appear from some hidden corner. We took to the stage as a silence descended upon the THOUSANDS of people in attendance, to perform our acapella set. There were around one hundred people seated to watch us, and of course, tours were constantly going through the cathedral the entire time. It was like nothing we had ever experienced. The thrill of singing in such an historic and elite venue, filled with beauty and people from all around the world, of all different faiths, really inspired our sound. There is nothing like singing and hearing the reach of your voice bouncing back to you from vaulted ceilings and angel statues. 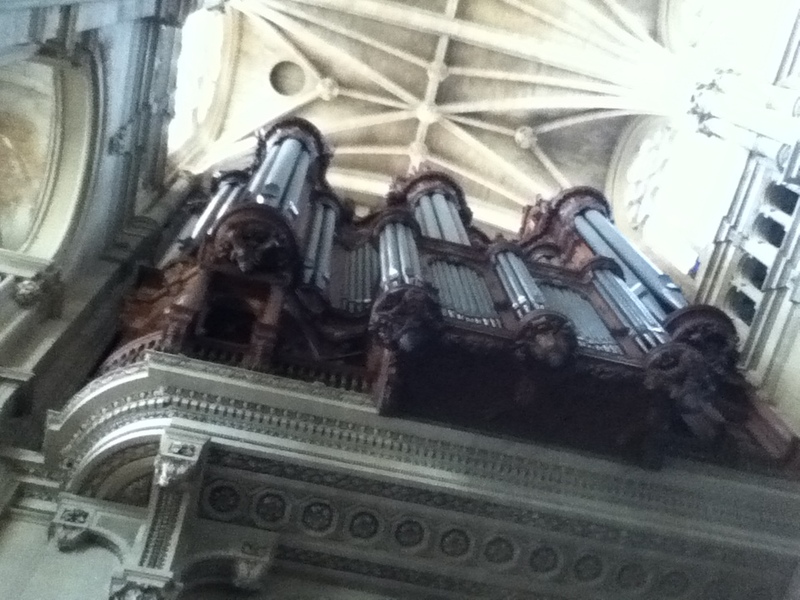 It sent shivers down my spine and I know it did for the other choristers too. All too soon it was over, but the whole audience broke out into applause as soon as we were done and we couldn’t stop beaming. To think our little choir from Calgary was doing this once-in-a-lifetime concert made us proud and appreciative of the gift it was to be here. When we got downstairs we were literally jumping from joy and excitement. There were even some happy tears shed, and an impromptu group hug! Ms. Strome surprised us with bracelets for us to wear for the rest of the trip, so that we would look at them and remember where we got them, and what we had just achieved. We then had a few minutes to look around, nowhere near enough time, but you could have all the time in the world and not know enough. 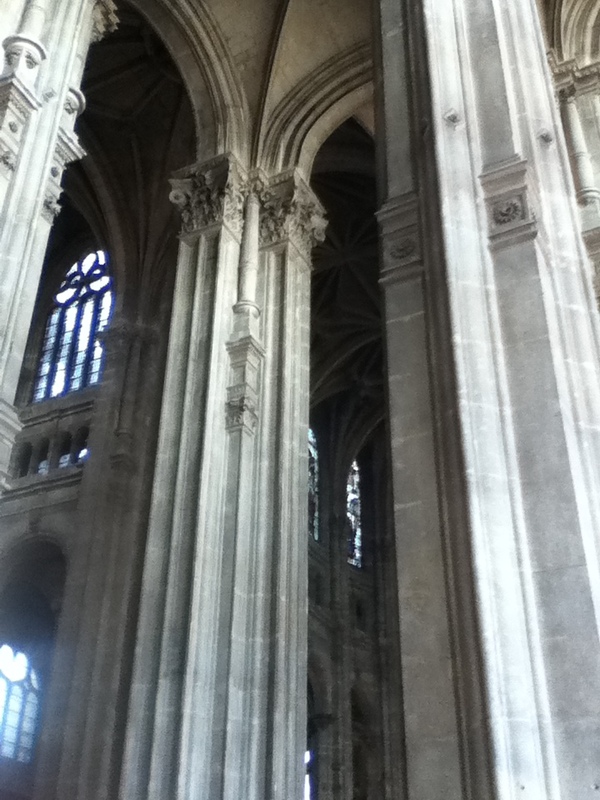 We walked around in awe of the cathedral, taking pictures that in no way do it justice. As we left for lunch, the bells were just beginning to ring the hour. It seemed to me that this time, the bells were ringing to thank us. We ate our lunch right outside the church in the bright sunshine as we ‘people-watched’ in the front courtyard; the bells deafeningly beautiful. After that is was a quick walk to the bus. 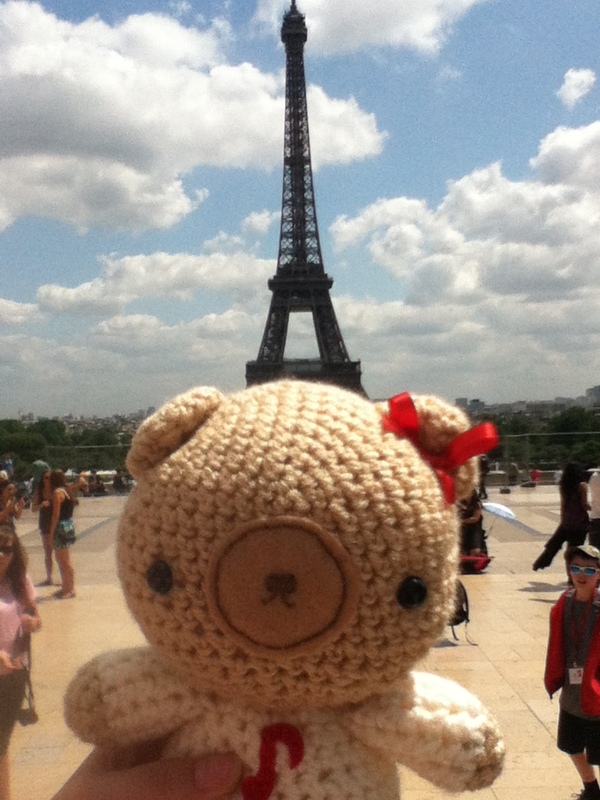 Paris truly is an amazing city. 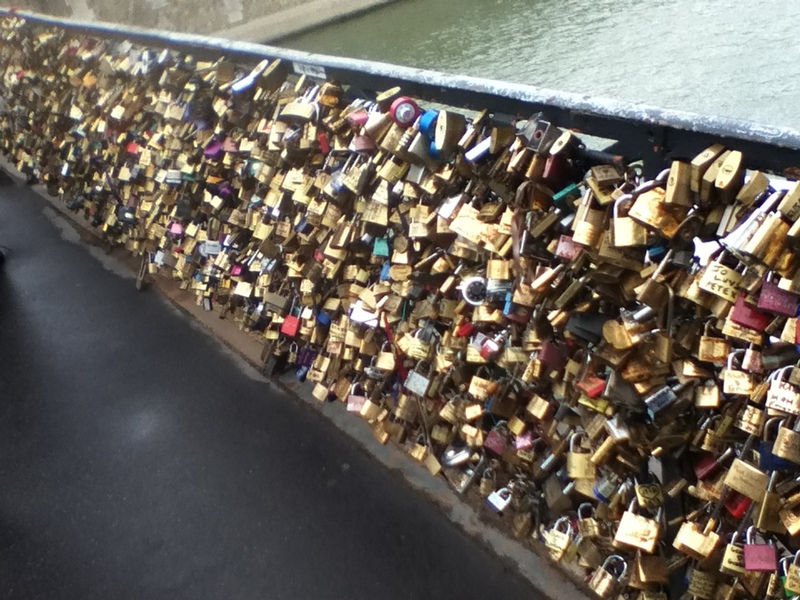 Every bridge is covered with locks placed there by lovers, musicians play soothing jazz, and each building looks like it is from a gilded fairy-tale. Their town hall looks like a fantasy castle! Our afternoon proceeded with a bus tour led by the knowledgeable Anika. And everything you can think to see in Paris we saw: the Arc de Triomphe, the Latin Quarter, Luxembourg Palace, the Grand Palace, the Louvre, the Egyptian Obelisk, the Champs d’Elysee, the Eiffel Tower, the Museum d’Orsay, the Invalids Palace, the military academy, and more! Rest assured everyone is coming home jam-packed with knowledge and photographs of this bustling metropolis! 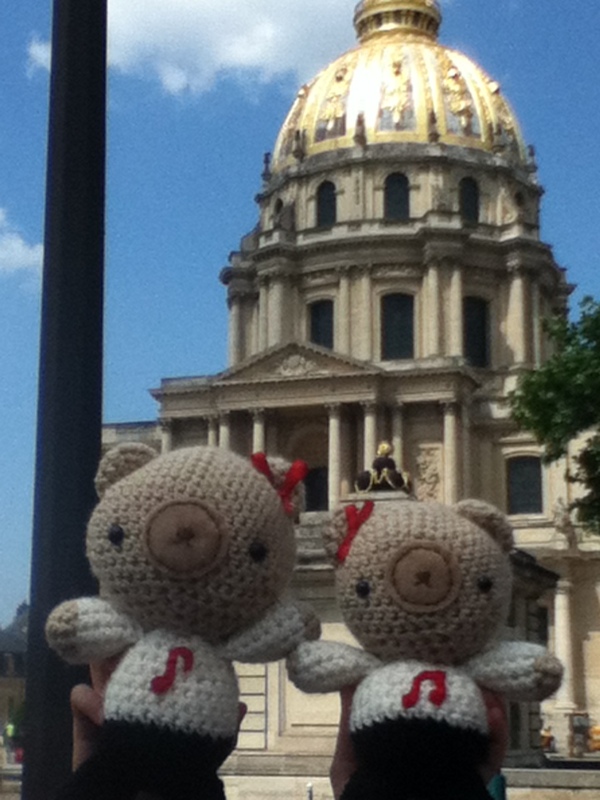 Rather than go back to the hotel before the concert, (traffic is absurdly bad in Paris), we were given some free time in the public park between the Concord Square (where the obelisk is, and where they are setting up for their national day festivities and the end of the Tour de France!) 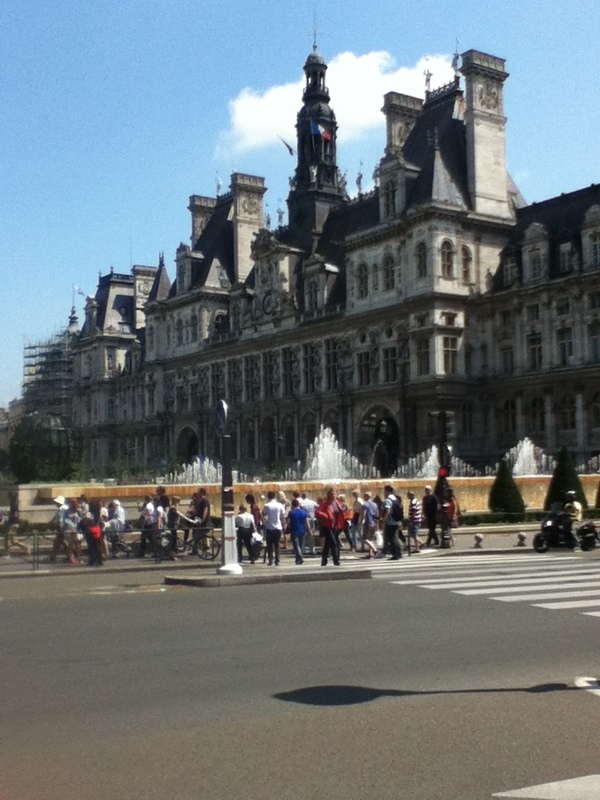 and the Louvre on the Champs d’Elysee. 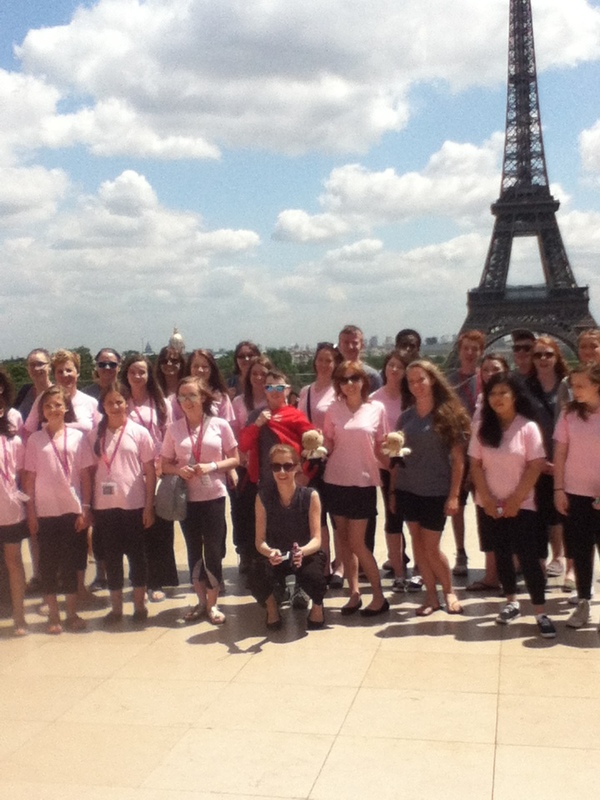 Choristers had time to buy refreshing ice cream, a few souvenirs, and to relax in the shade. 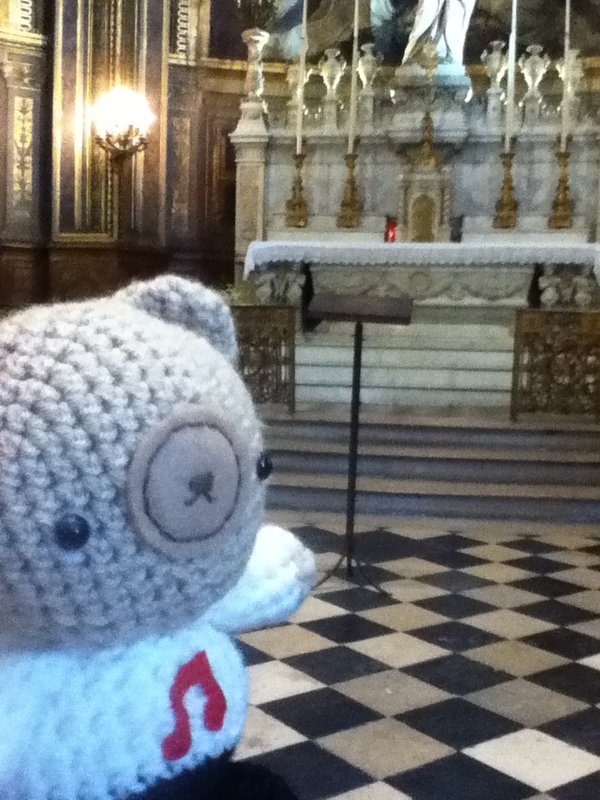 We were then back on the bus and whisked away to the Eglise Saint-Eustache. Mozart’s mother is entombed here. It is Renaissance in style with a more streamlined appearance; less cluttered than the previous Gothic tradition, and is just as impressive as the Notre Dame. We were some of the only people in there at first, and it was just as awe-inspiring as our morning venue. 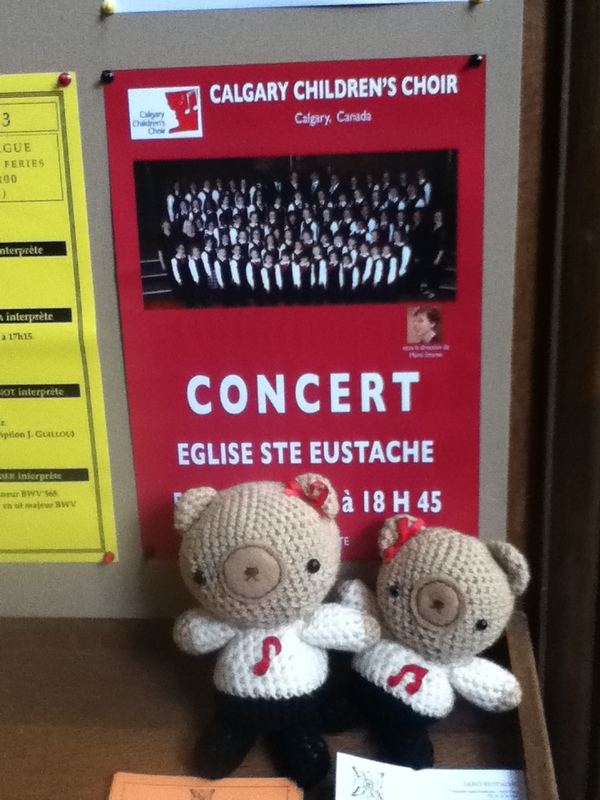 They even had a poster advertising our performance to their other visitors! We performed in a small area at the very back of the church to an intimate audience of about 30 people and they were very enthusiastic, as was our wonderful host, Louis! They loved the Cantique de Jean Racine, and This Train is Bound for Glory the best, which we sang last. The sound from our last dramatic chord was still ringing all the way down to the entrance, one hundred metres away, when we made our final “chhhhhh” sound for the train. It was to great applause that we wound down our musical day, followed by a delicious dinner in a nearby restaurant. I think we all agreed that this day was, in fact, the coolest day ever, and that it will be very difficult to top! But tomorrow is another day with more musical adventures in store! 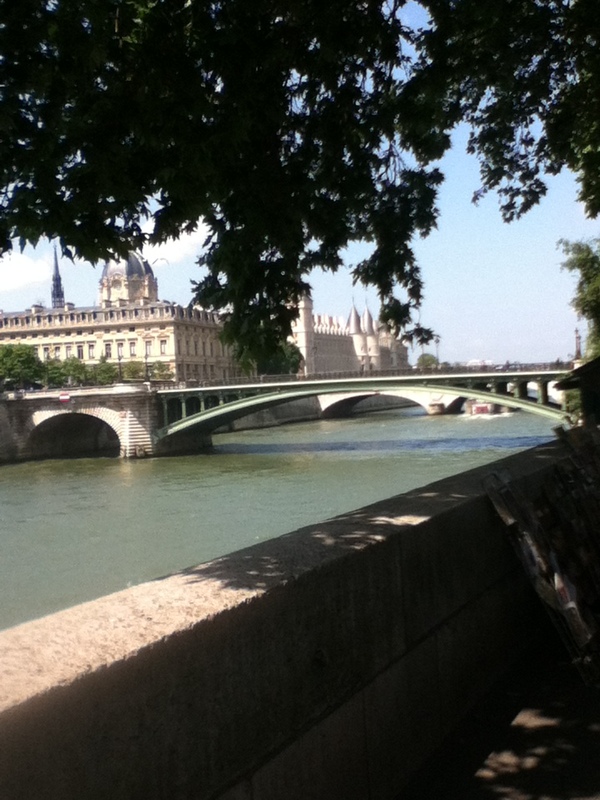 PS – check out this tweet from the Canadian Embassy in France! So cool! Thanks for,the uupdates. It sounds like you are having a marvellous time.